Jennifer and Efren were married in a Spanish mass at Blessed Sacrament Church in New Rochelle, New York. It was a traditional Catholic Mexican ceremony that involved an exchange of coins to solidify their union. The reception was also in Westchester Country at the Elmwood Country Club in White Plains, New York. It was a wonderful venue and the chef served up authentic Mexican cuisine for the cocktail hour that included seafood ceviche, beef or pork soft tacos, and guacamole with chips. There was a mariachi band that provided the entertainment during dinner and the guests loved every minute of it. Welcome to the NEW ChrisFig.com! In 2005, we launched ChrisFig.com as a basic website to promote the company, and provide potential customers with information and services. However, we did not create a website with the future in mind and we were unable to make subtle changes without effecting the overall layout of the site. As we all know, 5 years is a very long time in the technology world, and so much as happened in the development of websites. And so at the beginning of 2010, we began constructing a website that had the future in mind and that catered to our specific industry of video production. 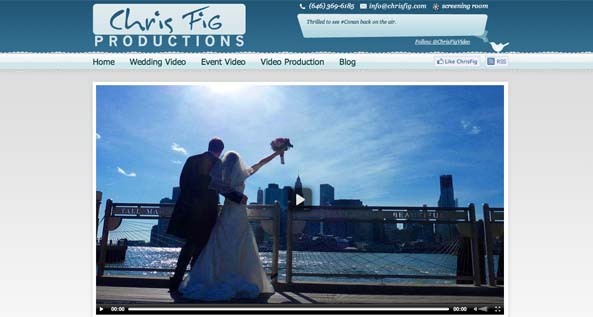 Chris Fig Productions creates about 5 hours of new content every week and we have thousands of hours of content in our archives. Unfortunately, we’ve never had a way to distribute this video content effectively to potential and current clients. That has all changed with the launch of the new ChrisFig.com.